War Service: Colonel, 4th Pennsylvania Militia, 1861, served with Franklin at First Bull Run after his regiment refused to fight. Colonel, 51st Pennsylvania Volunteers, November 1961. Participated in Burnside's North Carolina expedition. Commanded the 1st Brigade, Third Division, IX Corps at Battles of Wilderness and Spotsylvana. Appointed Brigadier General of Volunteers, May 1864. 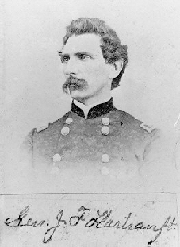 Commanded Third Division, IX Corps at Petersburg and Fort Stedman. Brevetted Major General of Volunteers for conspicuous gallantry in driving back the enemy at Fort Stedman, 1865. Provost Marshall at the trial of Lincoln's assassins, 1865. General Hartranft was awarded the Congressional Medal of Honor for "Voluntarily served as an aide and participated in the battle after expiration of his term of service, distinguishing himself in rallying several regiments which had been thrown into confusion" on 21 July 1861 at the Battle of Bull Run. For More Information: Gambone, A. M. Major-General John Frederick Hartranft : Citizen soldier and Pennsylvania Statesman, Baltimore: Butternut and Blue, 1995.